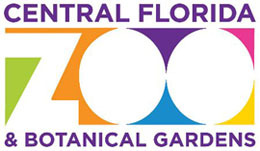 Enter the lush tropical world of the Central Florida Zoo & Botanical Gardens. A relaxing, entertaining and educational experience for the entire family. We’ve been at our present location since July 4, 1975 and we look forward to your visit. Besides seeing over 400 animals (that doesn't even include the bugs in the Massey Services Insect Zoo), you can take to the sky and enjoy our aerial adventure course, ZOOm Air Adventure Park or bring your flip-flops and swimsuit to cool-off in the Wharton-Smith Tropical Splash Ground. Become a Central Florida Zoo annual pass holder today, and your family will enjoy the Zoo for the whole year! With so much to see and do, your annual pass allows you to celebrate wildlife year-round, you'll be the first to know upcoming events, plus receive discounted admission to over 150 zoos and aquariums across the United States, and more!